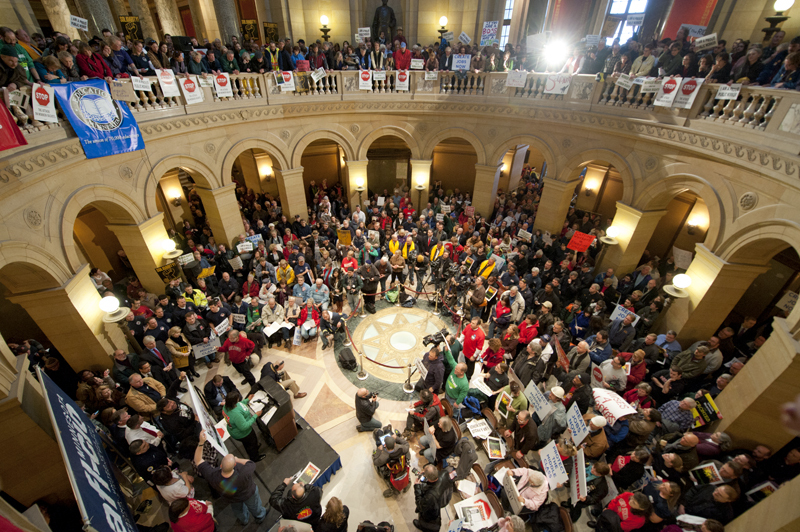 Over a thousand people packed the Minnesota State Capitol rotunda this afternoon, rallying in support of public employees in Wisconsin. It was a remarkably well-organized event, bolstered by a speech from Gov. Mark Dayton and the presence of Reps. Keith Ellison and Tim Walz. I have little of substance to say in addition to what we’ve written earlier on this blog, other than this: an optimistic reading of the past week’s events might be that Scott Walker has singlehandedly done what the Democrats, and Obama in particular, have failed to do over the past two years: re-energize progressive America. Even more, as Greg Sargent sort of argues, Walker may have inadvertently shifted the debate about labor unions such that the dominant discourse is no longer how terrible and corrupt and special-interest-like they are, but how they are a broadly accepted and necessary part of American democracy. These are perhaps overly optimistic interpretations of recent events, but if Walker has truly overreached, there may well be nontrivial consequences. If nothing else, Walker’s actions have enabled things like Nelson Lichtenstein getting to write a Politico op-ed titled “Why everyone needs unions.” That these messages are getting such prominent airtime is potentially reason for hope. A few more photos from today’s solidarity rally, after the jump. Went to a post-election analysis event today with a former staffer for Minnesota Republican Governor Tim Pawlenty, Brian McClung, and the current Speaker of the Minnesota State House, Margaret Anderson Kelliher. The state-level context here is that the governor’s race is going to a recount, although it seems to be generally accepted that the DFL candidate is likely to win; on the other hand, Republicans took control of both the state House and Senate despite the DFL having a veto-proof majority in the Senate and a near veto-proof majority in the House. So when McClung opened the panel by gloating openly, it seemed justified and actually not annoying at all. Kelliher, on the other hand, seemed to be in total denial. This wasn’t a true “wave” election, she said; if it had been, DFLers X, Y and Z would have also lost. “This is a story of very low turnout,” she said, which as far as I can tell isn’t just a terrible analysis, it’s actually factually untrue. Kelliher’s response was completely ineffective and questionably coherent. She agreed that Obama has to relate to voters better. “He has to get out of the White House and talk to real people,” she said, or something completely meaningless like that. Way to defend the foundations of Democratic economic policy in a recession, Ms. Speaker!